A year in, the utility has received 10,000 inquiries but has only closed five deals. Why might that be? Last July, Georgia Power launched a rooftop solar consultation service and a separate solar installation business. Together, the new offerings were designed to benefit the utility, consumers and other solar companies all at the same time. The Georgia Power solar program allows customers to learn more about going solar by completing a simple online survey. If customers choose to move forward with the process, they can sign up for a consultation with the utility’s solar specialists. From there, customers have the option of installing solar with Georgia Power’s unregulated arm, Georgia Power Energy Services, or selecting from a list of certified solar installers. The program represents an opportunity to transform the way customers purchase distributed energy resources and reform the relationship between utilities and solar companies. The online platform allows installers to leverage the utility’s brand and access to customers to grow their businesses, while the utility remains in the middle as a trusted service provider. There’s also the potential for a new revenue stream via the utility’s unregulated business. However, a year in, the Georgia Power program has produced underwhelming results. Since the launch last July, Georgia Power has received roughly 10,000 inquiries through its online platform, which has resulted in nearly 800 detailed customer analyses. But the utility’s unregulated business has only installed five rooftop solar systems to date. Just five. “Certainly there’s an interest and desire to have renewable energy in the Southeast, but at this point, it really is being completely dominated by utility-scale,” said Kim Greene, chief operating officer and executive vice president at Southern Company, Georgia Power’s parent company, speaking at the Edison Electric Institute annual convention this week in Chicago. Overall residential solar numbers in Georgia are very low. As of Q1 2016, there was a grand total of 273 residential solar systems installed in Georgia Power territory -- these are customers that have been interconnected through the utility’s solar buyback program and sell excess generation back to the grid at the avoided cost of electricity. Georgia Power does not currently offer retail-rate net metering. Of the 273 total, 80 customers were interconnected in Georgia Power territory in 2015. The majority of these customers worked with a third-party solar service, given that only five customers have used Georgia Power Energy Services so far. It is not known how many customers used Georgia Power’s solar consulting service and ultimately selected a provider other than the utility, and how many worked solely with a third-party installer from the get-go. But it’s safe to say the numbers are low. Greene added that it’s hard to see more than 1 percent of Georgia Power customers installing solar any time soon. The utility currently serves 2.4 million customers, so 1 percent would equate to 24,000 customers. There’s a long way to go with less than 300 solar customers on-line today. “We’re listening [to customers] and we want to be part of the solution, but right now, on-site solar is something folks just aren’t willing to commit to,” she said. Do Georgians not like solar? There are a few reasons why this might be. First of all, the Georgia Power solar program is young. The consulting service and the unregulated solar business are just one year old, and so there’s a lot of customer education still to be done. There is also a limited number of solar products offered in Georgia. On the same day that Georgia Power launched its unregulated solar installation arm, the state began to allow third-party financing. Despite that change, the utility only offers a solar purchase option. In addition, the website says little about other financing options that allow for immediate savings, which is a key benefit for many customers. Furthermore, leading solar leasing companies including SolarCity and Sunrun do not currently operate in Georgia. If more leasing options were available in Georgia, it’s possible the rooftop solar installation rates would be significantly higher. National solar companies likely haven’t come to Georgia because the state does not require utilities to offer retail-rate net metering -- a key policy driver for rooftop solar. According to Tyson Grinstead, senior manager of public policy at Sunrun and spokesperson for The Alliance for Solar Choice, his company hasn’t entered the market because Georgia Power wants to dominate it. It’s not because solar companies see a lack of interest among Georgia customers. In neighboring South Carolina, where there is retail-rate net metering, market growth has been strong. Low electricity prices are yet another factor. According to the EIA, the average residential electricity rate in Georgia is 10.66 cents per kilowatt-hour. For comparison, the average rate in California is 17.71 cents per kilowatt-hour. Even when selecting the most favorable circumstances for adopting rooftop solar on the Georgia Power survey, the shortest payback period available is 13 years. For many customers, that’s just too long. So maybe the number of solar installations in Georgia Power territory is so low because economics just don’t make sense. Or maybe it’s because Georgia Power is bad at selling solar. 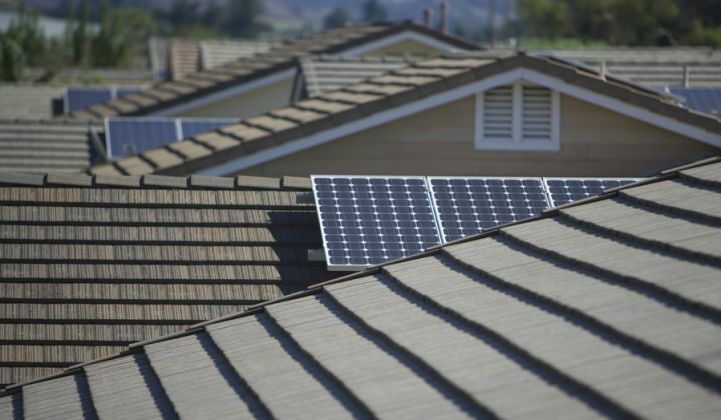 Going a step further, maybe the utility doesn’t really want to sell rooftop solar, even through its own unregulated arm, because solar is taking business away from the regulated utility. Undeniably, there are ways in which the service could be better. The lack of financing options is one issue. The information could also be presented in a more compelling way. For instance, the website SolarPowerRocks.com shows relatively conservative figures on payback periods in Georgia, but lays out how customers can still make solar work. In addition, the Georgia Power website states that the utility will respond to solar inquiries “within three days,” when there is a mountain of evidence showing that it’s optimal to respond to customers in seconds. So is Georgia Power selling solar short? Does Georgia Power not like solar? The fact that the interconnection numbers for other solar companies are so low would suggest the economics do indeed play a major role. “It’s not as though third-party ownership became an option and SolarCity and others came in and started selling thousands of systems where Georgia Power isn’t,” said Julia Hamm, president and CEO of the Smart Electric Power Alliance. So what about the hope that a utility-run platform would facilitate access to distributed energy resources in a win for all stakeholders? Is there still potential for that model to work? Hamm says yes, pointing to similar examples in New York and Rhode Island where there are more robust solar markets. Another interesting aspect of the Georgia Power program is that while not many customers have gone solar, the platform has served as a way for the utility to educate customers on other ways to reduce their bills or meet their green goals with things like efficiency and community solar. The Georgia Power solar platform “turned out to be a great way for Georgia Power to position itself as a trusted energy advisor,” said Hamm. Meanwhile, solar companies may be left wondering how they can position themselves to gain business in Georgia.